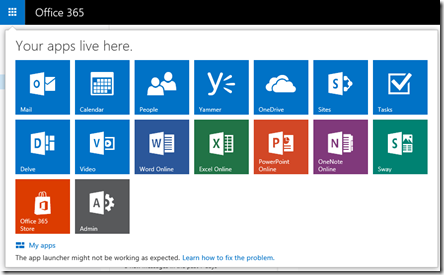 If you select the ‘waffle’ in the top left corner of Office 365 (the 9 dots), you’ll see a list of your applications as shown above. This menu is known as the App launcher. 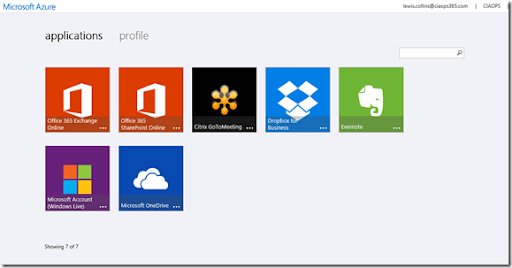 Most users will simply see their Office 365 apps. What you might not appreciate is that you can add your own apps to this list a number of different ways. 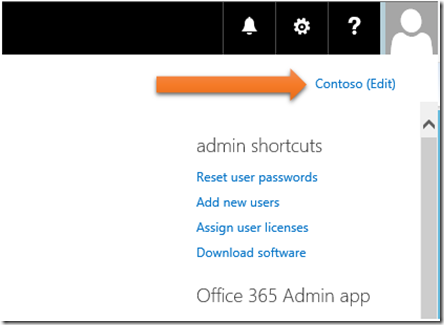 The easiest way is to login to the Office 365 console as an administrator. In the top right you’ll find a link for the business name (here Contoso). Select this. On the screen that appears select Custom Tiles from the menu on the left hand side. Then select the + icon to add a new entry. 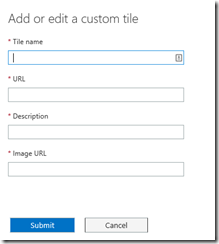 Enter the details for the new tile and select Submit. You should then see you new listing (here, CIAOPS). 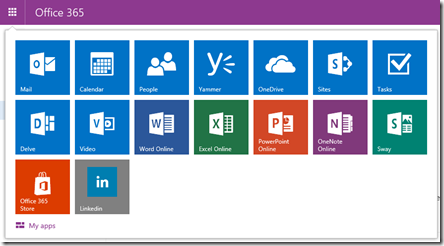 The new app is available for all users to add to their own App launcher. To do this, select ‘waffle’ in the top left (the 9 dots). When the App launcher appears select the My apps link at the bottom of the page as shown above. They will now see a list of all the app available to be ‘pinned’ to their App launcher. The ones at the top are the ones already on the launcher and the ones at the bottom are those that can be added. To add a new app to the launcher simply mouse over it and select the ellipse (3 dots) in the top right corner. Then from the menu that appears select Pin to app launcher. Now when the ‘waffle’ is selected you’ll see the app displayed on the launcher as shown above. When you select the new app it will open is a new browser tab. When the portal is complete it should look something like that shown above for users. 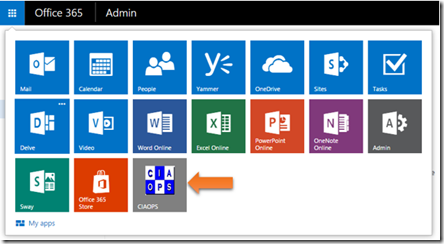 Now when that same user goes to modify their own App launcher via the previously detailed method they will see the custom app just added above via the the admin portal (the CIAOPS App) but also all the other already configured in the Azure SSO portal. They can then add any of these Azure SSO apps to their App launcher using the previously detailed method (in this case Linkedin). 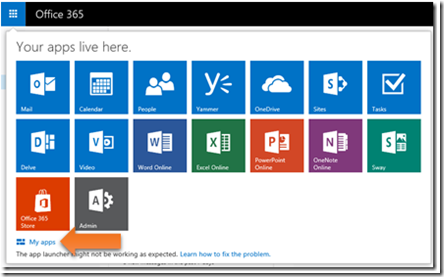 When they select this new app, added from Azure AD SSO portal, it will function the same as it does inside the actual Azure AD SSO portal. It will log them into that web based app automatically without the need for entry of a login and password. 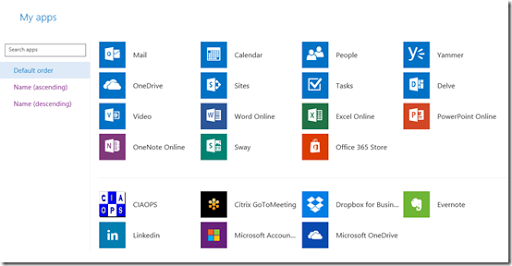 You can now customise the Office 365 App launcher to include any web based app and if you also enable the Azure AD SSO portal you can take advantage of automated login for these apps. That makes life a lost easier and more productive for users.